In what doesn't sound like the best plan ever, David decided to overcome his fears by pretending to be an accomplished comedian called "Irish Dave" for one full year, crashing as many comedy clubs, festivals, and shows as possible. One part of the plan was at least logical: he was already Irish and already called Dave. In one year, David went from being deathly afraid of public speaking to hosting a business conference, regularly performing stand-up comedy and winning storytelling competitions in front of packed houses. And he did it by learning from some of the best public speakers in the world: stand-up comedians. Do You Talk Funny? 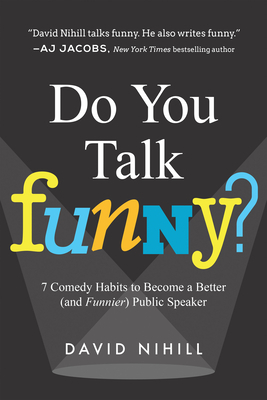 : 7 Comedy Habits to Become a Better (and Funnier) Public Speaker shows how the key principles of stand-up comedy can be applied to your speaking engagements and presentations to make you funnier, more interesting, and better looking. (Or at least two of the three.) Whether you are preparing for a business presentation, giving a wedding toast, defending your thesis, raising money from investors, or simply want to take on something you're afraid of, this book will take you from sweaty to stage-ready. Ten percent of the author's proceeds from this book will go to Arash Bayatmakou via Help Hope Live until he is fully back on his feet and thereafter to one of the many facing the same challenges after suffering a severe spinal cord injury. David Nihill was born in Dublin, Ireland. After graduating with a Master's Degree in Business in 2003, he moved to San Francisco where he worked for the Irish government helping startups expand rapidly. He has been involved with startup companies ever since. David is the Founder of FunnyBizz Conferences, a community conference series helping content creators tap into the power of storytelling, comedy, and improv to create better content. He has performed stand-up comedy at California's leading clubs including Cobbs, the Comedy Store, the Improv and the Punchline even though he strongly denies being a comedian and is well aware most people don't understand his accent. His learning, taken from one year's intensive experiments in comedy, performed on someone from the business community with a huge initial fear of public speaking (i.e. him!) have been featured in "Inc." and "Forbes," among others. He loves sharks, still dislikes public speaking, and calls San Francisco home when immigration officials permit. Nils Parker is the editor of multiple "New York Times," Amazon, and "Wall Street Journal" bestselling books, including "I Hope They Serve Beer in Hell" and "Assholes Finish First" by Tucker Max, "Trust Me, I'm Lying" and "The Obstacle Is The Way" by Ryan Holiday, and "Choose Yourself" by James Altucher. He loves comedy, Cal football and his wife. Not necessarily in that order.